A mostly wet and breezy day which saw the usual Monday slumber awoken early by the arrival of Allelys to collect the Class 108 E50599 and Class 101 E51505. 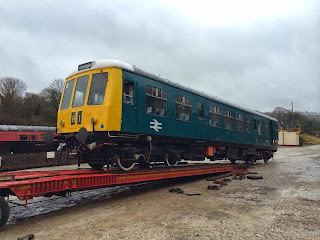 These vehicles have gone to the Bluebell Railway on loan for a few months to operate winter services there. Not only is it the first time a DMU has operated on the Bluebell (remembering that the Bluebell has been operating as a heritage concern for the whole length of time these vehicles have been built) but it will also be the first time these two vehicles have operated as a pair because they face the same way with us. 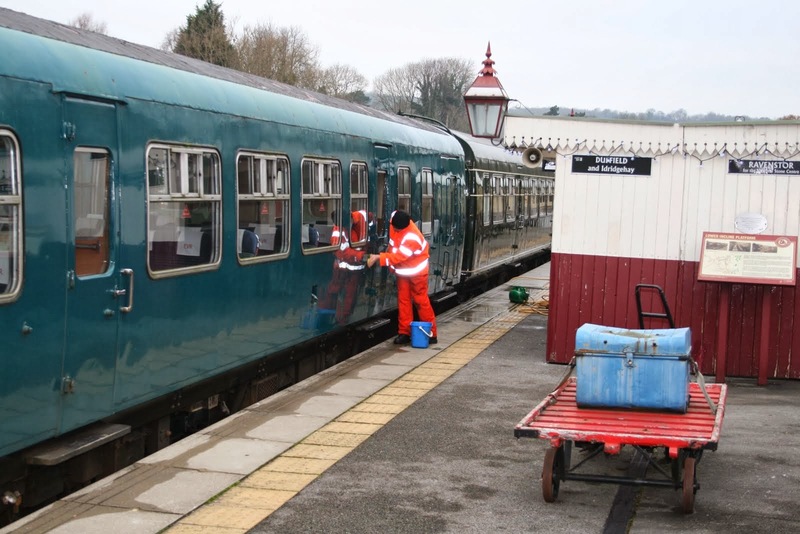 After this excitement, some small shed improvements were undertaken and some painting took place in the guards van of 50253.
antimaccassars being checked to make sure little greasy fingered tykes hadn't been in to muck up our pristine presentation. Back at the station the New Year ritual of changing the timetables took place which also involved cleaning the running in boards. This was followed by sweeping the forecourt, which is also part of a process to record our assorted potholes, with a view to dealing with them once the weather warms up. It was slightly breezy round our parts today, as it often is in December, although this seemed to be major news to the media, presumably who all live in Surrey and to whom wind is probably something the cat has. Meanwhile, the Christmas hangover continued and so we tidied up as quietly as possible. Down the yard, the tidying up included the Tool Van and at the station the wheelie bin had been miraculously emptied by the skip fairies and so we filled it again. The Higham Charter rumbled its way down the line, pausing only for a very short moment to allow a senior magistrate to address a tree with the loppers, but the line in general was gratifyingly tree free, a testament to the work being done to keep our wood nice and presentable. Bah Humbug progress Christmas eve 2013. Plenty of people around the railway today from LMSCA and the steam team. However, since they decamped long before we returned we haven't the slightest idea what they were doing today- though I suspect more of the usual. P Way trundled off to Shottle with the Komatsu and the land rover with tools since no breeze driver was forthcoming. This allowed us a useful check on the line for fallen trees etc. Land was levelled out on the down side of the loop to form a stock ground for all the unused copings laid around the site and said copings were duly removed to their long term resting place. The turned out rail in the up side track was replaced along with all the missing fish bolts on the up side of the loop. A rail has been removed at the south end of the down side loop for protection so we can use this side for the works train during further works. Points at each end of the loop have been normalised, clipped, scotched and the switch blades secured with fishplates in the time honoured manner for out of use points pending their connection to ground frames in the near future. 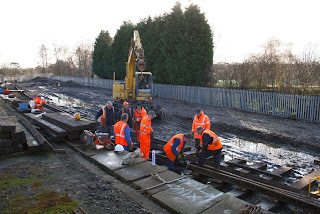 This means that from today up and down trains will travel through Shottle station on the up side track and although the platform wall is now complete the platform surface remains to be done so trains will not stop here just yet,.A lot of work completed by a gang of four. Did you know that days off during Christmas holidays since the dinosaurs vanished has been approx 130 million days which equates world wide to approx 390 trillion trillion man days of wasted labour. And people moan there just isn't enough time to do anything- well I know the cure for that! Bah Humbug. A few words to express my admiration for the Santa team's efforts over the past three weekends and the background work that has gone on over the four months leading to the delivery of the trains. The tremendous achievement of some 70% growth in revenue and the great positive feedback from the participants demonstrates that everyone's efforts were thoroughly appreciated. The coming together of all our various departments to focus on this key time of year was also most gratifying and made it all work wonderfully. So, a little time to relax and enjoy the festive season before we get into go mode again for 2014 where more great things are planned to move our enterprise forward. Have a very pleasant Christmas and I will raise my glass, several times, to you all. Today's picture shows again how far we have come in a very short time with a glimpse of the late, lamented Vince Ware as part of the team. Well, the final day of Santa Trains saw us entertaining children and adults alike throughout the day: we have had tremendous feedback and, with one or two tweaks, we seem to have a winning formula. 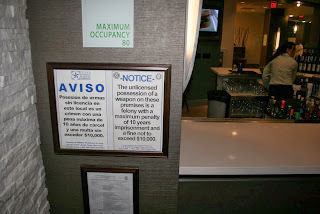 Many thanks to everyone involved in securing such a successful outcome. In the background, the Tarp Tuggers, sorry the DMU Team, stormed along with wiring and Formica stripping in unit 50253, as well as undertaking some much needed yard tidying jobs. At Duffield, the Station Foreman also carried on the theme of tidying up. Yule Log be seen burning brightly in the night from far distant and remote places. The penultimate Santa trains were our main focus today with three packed services to the North Pole. Down the yard the LMSCA and DMU teams worked on their respective projects. 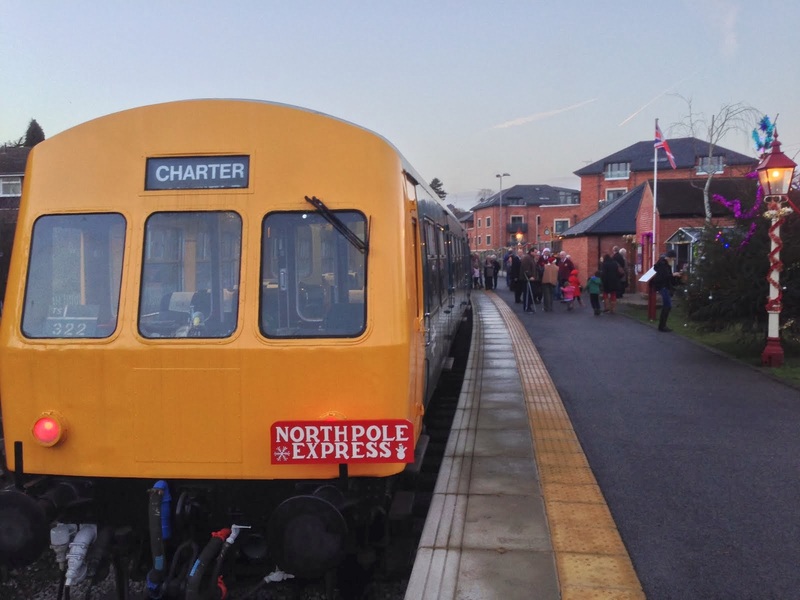 The dmu team readied the Santa train for a special train to give the pupils of Wirksworth's infant and junior schools a train ride before meeting Santa. Santa is pictured preparing himself for the energy required prior to their return in the Pullman Buffet Car. The PWT track patrolled between Idridgehay and Shottle together with more work on the drainage at Gorsey Bank after the charter train had returned to Wirksworth. I am very grateful to David N for tending to the office lighting after the fitting finally died. The solar powered calculator couldn't cope with the lack of light! 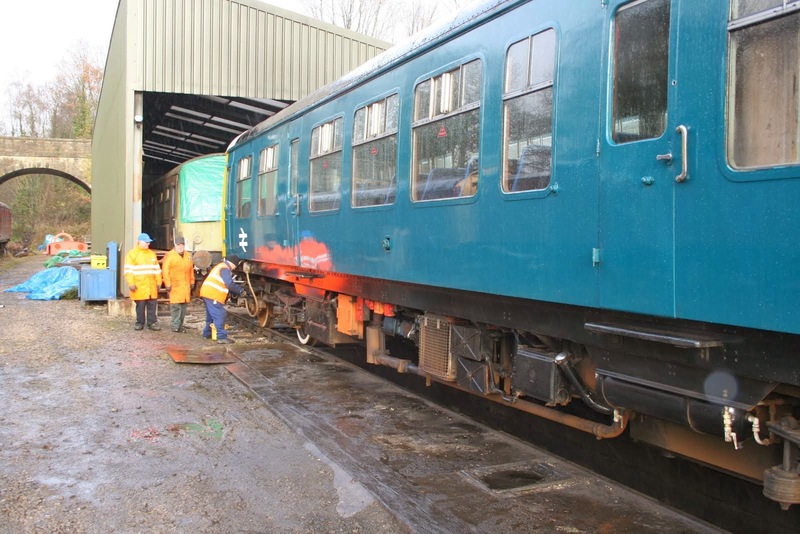 The LMSCA continued with the exterior preparation of the Third Open and dmu team expended more energy on Bluebell preparations. 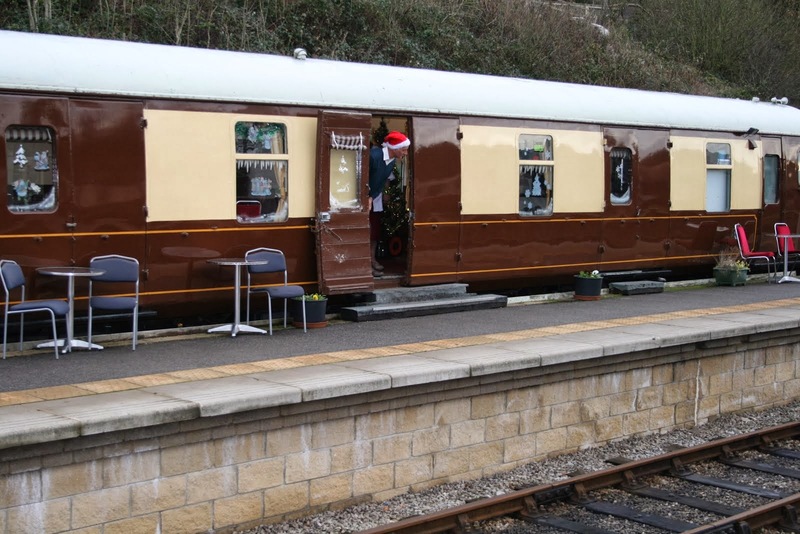 The Pullman Buffet Car seem to be on the destination list for winter walkers and the Booking Hall finalised the share holder Christmas mail out as well as circulating the significant achievement for the coming weekend's Santa trains. 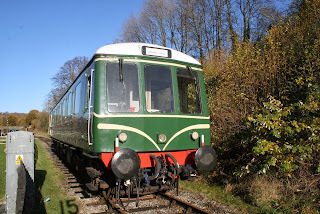 Christmas Day is only a week away and our last Santa trains approach this forthcoming weekend. We are managing to squeeze put the maximum possible for our enterprise causing palpitations in the present acquisition and assembly department. Nonetheless it reflects great credit on all involved that business has grown some 70% this year which helps immensely our insatitionable ability to spend money! The PWT set off for the south gathering up the recovered drainage pipes from Gorsey Bank, repairing a manhole there and delivering the pipes to Shottle. They returned with VCT products for sale at Wirksworth. We welcomed the Amey structure inspector who has completed his survey of our cuttings and embankments with no major problems found. The LMSCA solidly continued with their major endeavour of the fire damaged Third Open. The Pullman Buffet Car was busy with and unexpected party of walkers and the Booking Hall continued to benefit from the availability of driver experiences on line and neared the end with the shareholders Christmas mail out. We welcomed an old soldier, Phil Tarry, who seems to be strangely involved in the Whipsnade Park railway and its only fair to show a photo of him entertaining the London and Wirksworth Fire Brigades during the test of a trolley that could be carried down to the deep level tubes. At first a special mention to Amey who have been charged by Network Rail to check on our retaining walls, embankments and cuttings. Today was day three of their activities and we await the results of their endeavours with interest.The VCT tended to the combined debris of the great wind near Derby Road bridge and the pre-cut brash and tree trunks at 40 steps. They reported a five man team and one substantial fire. Mike the Flail set off to tackle the Bournebrook Avenue straight south of Gorsey Bank crossing to good effect. 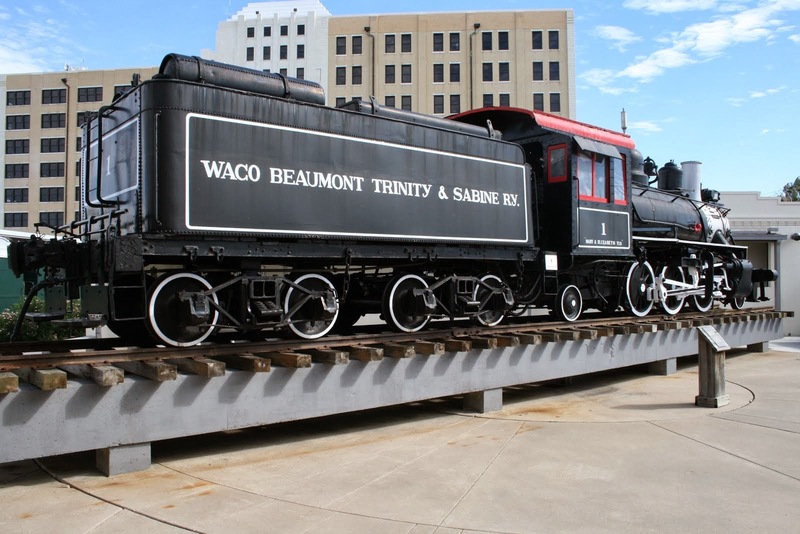 Mary Birch volunteered to give the Santa train a clean whilst her husband, Rod, joined the DST to tend to Cathryn's springs and the adjustment of Henry Ellison's slide bar. 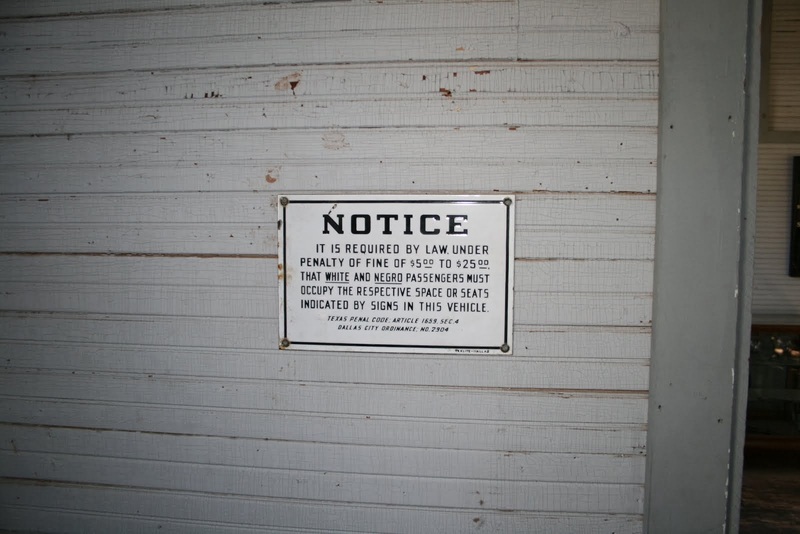 The Filing Fairy was in action and Fred & Iris gave the Mess Hall a very welcome cleanse. 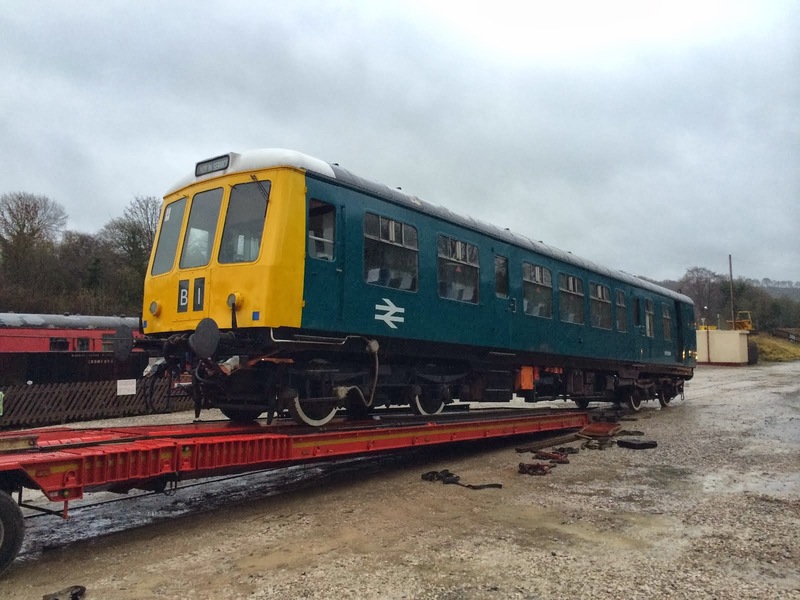 The dmu team continued with readying 51505 for its journey south and the LMSCA tended to corner pieces, guttering and sanding on their Third Open. The PWT accomplished the majority of their track patrol together with further fabrication of the Shottle North Ground Frame. This process was assisted by our resident photographer who is illustrated with a wire brush unfortunately slightly in the shade. The Pullman Buffet Car had a good day and the Booking Hall was energised by a further Bronze Steam Experience reservation, squeezing the last out of the Santa opportunities and posting out the Christmas mail out to shareholders. considered we did remarkably well with busy trains and happy small people. 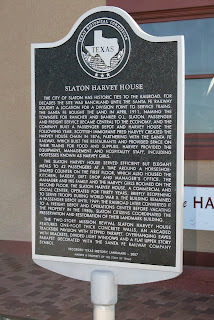 My thanks once again to all involved. as well as baking gently in their brake van. In the shed the DMU team continued with their efforts in the form of giving the guards van of 50253 its first gloss coat of paint and restoring some of its Formica. By way of celebration the DMU team are at this very moment having a conflagration at a certain Chinese restaurant. Sorry, a collation at a certain Chinese restaurant. 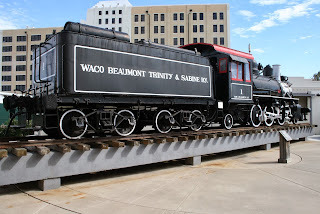 The main focus today was the second weekend of our Santa Trains. All services to the North Pole were fully booked and thank you to everyone who, despite a very tight schedule, helped ensure all trains departed on time. Our new catering arrangements for the Santa Trains is proving exceptionally popular with our visitors and I attached a photograph of a very festive decorated T.S.O. 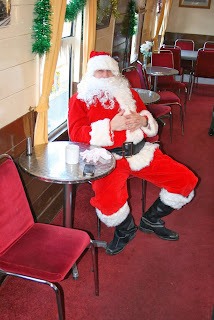 A day of leisurely preparation for the weekend's Santa trains, around the station, in the vehicles and in the buffet. The Booking Hall's administrative powers were put into gear stuffing the annual Christmas Greeting to Shareholders, and this will be hitting your doormats in a very soon moment. Down the yard the Head of DMUs attended to his charges and the LMSCA attended to the Third Open, which received more spray paint and became increasingly watertight. The Station Foremen spent the morning on the monthly inspection and then fixed various things which had fallen off due to rot and over-excitement. A foggy, damp day that didn't inhibit the project moving forward. The PWT set off for Shottle to move their recovered drainage pipes for further reuse north of the station and recovered a further load of logs for sale. 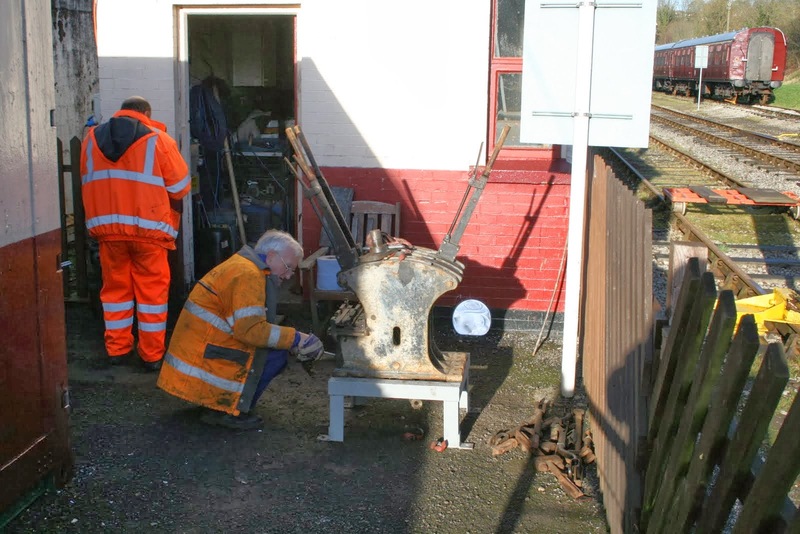 The dmu team puzzled over the failure of one engine from the south end of the Santa train and put more effort into preparing 51505 for its journey south. The VCT completed their task in the area of MP 134 which has opened up a pleasant section of line for our passengers. 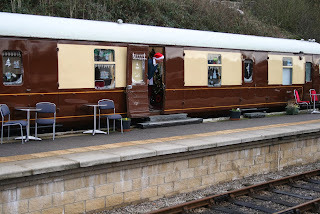 The Pullman Buffet Car looked after the team on site at Wirksworth and the Booking Hall squeezed a few more passengers onto the remaining Santa trains. The protracted process of a mail out to our share holders is also under way. Today's photo is of a resident elf - who is this person? PS - I failed to mention the efforts of the LCC and family yesterday as they gave the Santa train a clean for this weekend and further tended to the marshalling of presents for this weekend's children. It's easy to gloss over the tremendous effort being put into this component but without it the whole process would not work. I'll start with a little bit of catch up! After the very high winds last Thursday a few stalwarts responded to an appeal to check the line ready to deal with any fallen trees and I am extremely grateful to Tony Watt, Mick Thomas, Mike Billings and Paul Rayner who turned out and dealt with some six trees that had blocked the line and would have prevented any Santa trains running this past weekend. 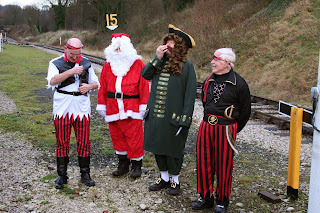 The first Santa train weekend was a joy to behold with the new format working extremely well and again the team should take a substantial bow for all the preplanning, present preparation and delivery of something that all the participants seem to have thoroughly appreciated. The process is very labour intensive and we take our hat off to all who actively participated from across our many departments. I cannot overemphasize how valuable this season is to our general financial wellbeing. We were back to the normal tasks of running a railway today with the PWT changing some sleepers south of Gorsey Bank and continuing work with the Shottle ground frames. The track recorder was employed between Shottle and Hazelwood and Mike the Flail continued to attack the "racing straight". The VCT returned to their project around MP 134 and commenced dealing with the debris from the great wind. Five team members on site and two large fires reported. 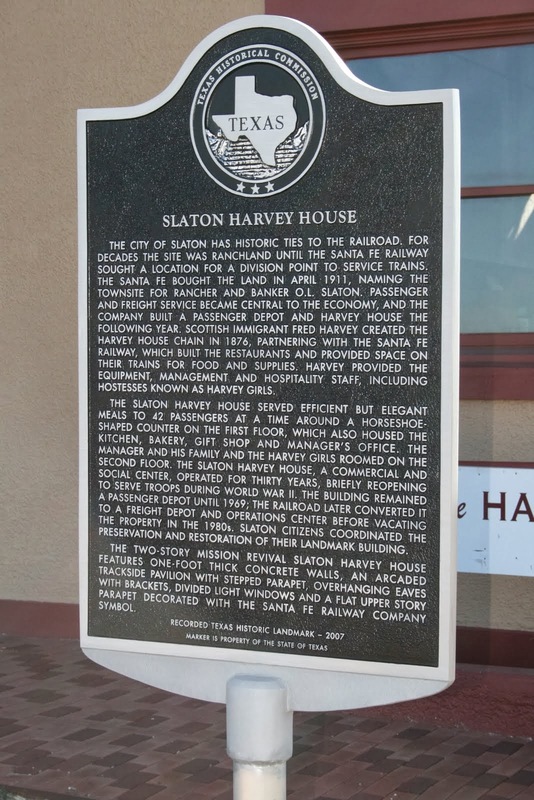 The LMSCA concentrated on the guttering for the Third Open and completed the last section on the east side. The DST tended to the clack valves and gauge glasses on Henry Ellison and fettled the springs from Cathryn. Amongst the challenges faced by David N was the renovation of lighting in my office, a security light outside the Pullman Buffet Car and a fault on the extension lead within the vehicle. 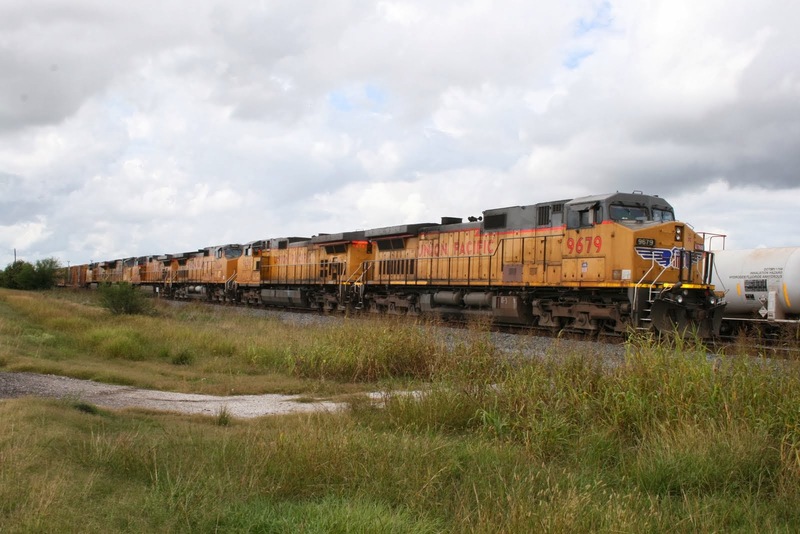 Tasks not associated with railway preservation but essential to keep the enterprise together. The Pullman Buffet Car had a pleasantly productive day and I am extremely pleased to report that the Booking Hall received its first response the recent coach operator mailout following some diligent research by the Cooke family. Today's photo shows the effort being put into the preparation of the fleet that will serve the Bluebell Railway - I hope they appreciate the quality that is approaching them! PS - The Pullman Buffet Car will close after our New Year's Day trains until Tuesday 18th February as we tend to a drainage problem and reconfigure the counter area. PPS - Anyone who has been trying to communicate with Pat and Mike Craft by email should be aware that they have had major problems with their technology and won't be online for a couple of weeks - I suggest you don't ask them why unless you have a few hours to spare. PPPS - I have been trying to sent this message several times and the system seems to have taken against the word "Tuesday" in the heading! 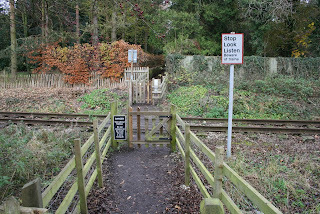 I have received an email from one of the parents who uses the path over the railway line in Duffield. They have asked me to express their thanks for the work you have done to widen the gates and posts. I would also like to pass on my thanks and to let you know that I appreciate all the work you have done over the last 5 years to improve access on paths over the railway line. If this finds its way through the ether today saw the Permanent Way Team recovering materials from Gorsey Bank that are no longer required there in the form of drainage pipes. They also started to remedy the drainage through the crossing that was disturbed during previous attempts to ensure the water descending on this part of the Railway was properly channelled. 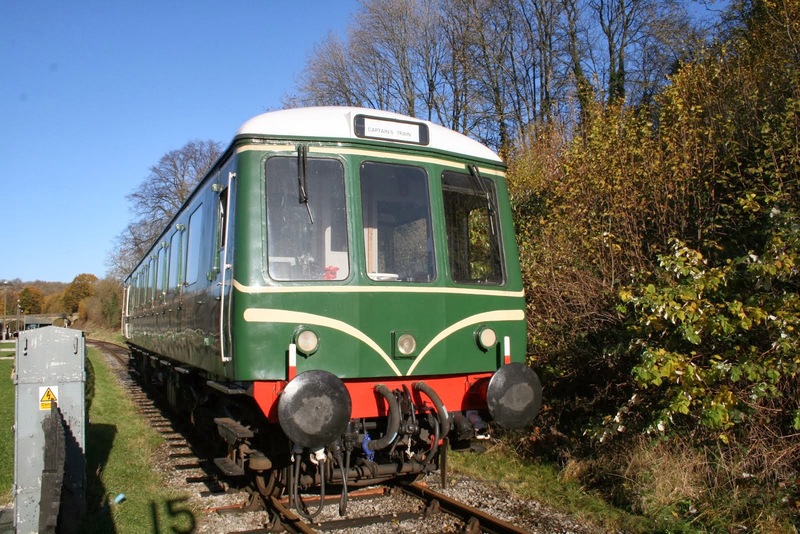 The dmu team continued to lavish attention on the vehicles that will operate on the Bluebell Railway in the new year and I am pleased to report that "Bubble Car" 55012 will join our fleet to be hired out when and whenever opportunities present themselves. The Pullman Buffet Car struggled in the damp, cold and foggy atmosphere to detect a customer but the Booking Hall responded to Santa enquiries and was able to satisfy a few more eager customers as we have gently lifted the numbers we can carry on each train. Today's photo is a blast from more relaxed times during the Santa season. A sunny but cool start to the First day of our Santa specials, Wirksworth to the North pole. Loads of smiling faces and shouting children ( adults as well ) greeted Santa as he boarded the train and enjoyed his day so much with us he as promised to be with us tomorrow and the next too weekends . Well done guys my hearty thanks to you all and those who worked hard behind the scenes. Ps one young lady would like to know why santa has shrunk by a foot . An excellent day thanks to all your valiant hard work , so Im off to have cheese and a cold tawny port . A slightly chilly day saw the LMSCA welding the roof of the Third Open in the balmy confines of the shed, however the welder expired, technically the welding machine as opposed to the welder himself, and this saw the hoped for culmination of a finished roof missed by a short hair. Down the line, the windy woodland bowsaw gang (which makes it sound like the Trumpton Fire Brigade had a secret criminal life) endeavoured to clear the line of newly blown tree parts. For the rest of us, the morning began by manning the National Confused Customer Helpline, followed by an afternoon of the European Tinsel Challenge. preparation, from bookings to presents, from electrics to decorations, and thank everyone involved, in whatever capacity. While I don't know about anyone else, I propose to be face down in a wheelbarrow outside the Whore and Trumpet (A Marston's House) for some time to come. It has been a bleak windy day but we have got off fairly lightly looking at the news from other parts of the UK. We now know that we have some tree debris at Duffield and Tony has agreed to do a track patrol from Wirksworth at around 1000 tomorrow. If anyone can join him they would be well received. The PWT gathered some timber that had accumulated at the south end of Wirksworth's Platform1 and then tended to the drainage at Gorsey Bank to try and avoid the flooding recently experienced there. The team also made an impact on the drainage at what has always been called the white bungalow near the Hanages foot crossing. The bungalow is no more and been replaced by a larger house but there remains an ongoing debate about the water flowing off the hillside, under the Railway, and through these premises. The wind also has destroyed the steam engine water supply from the "new" black tank to the locomotive which will be tended to in the fullness of time. 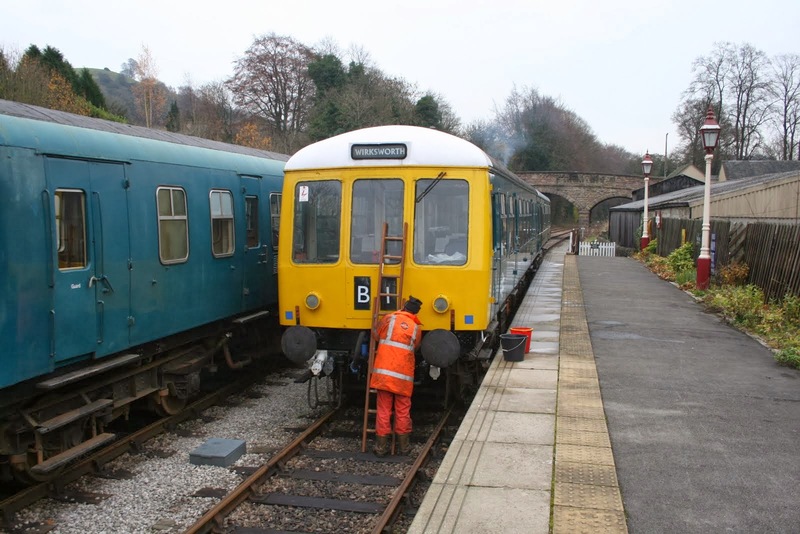 Today's photo shows the dmu team continuing with the preparation for two of our fleet spending some time in the south. 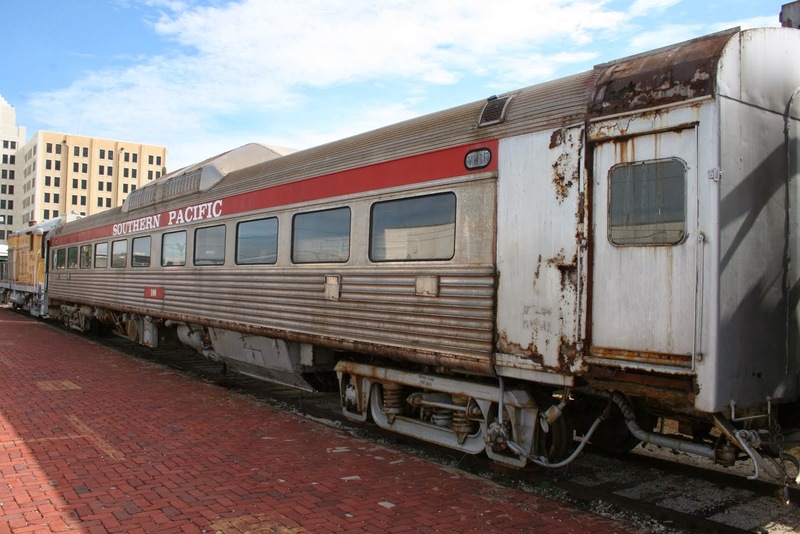 The Pullman Buffet Car traded quite well in the inclement weather and the Booking Hall responded to late Santa bookings and the inevitable changes in customer requirements. It is quite an achievement to grow this part of our enterprise by over 50% in one year. 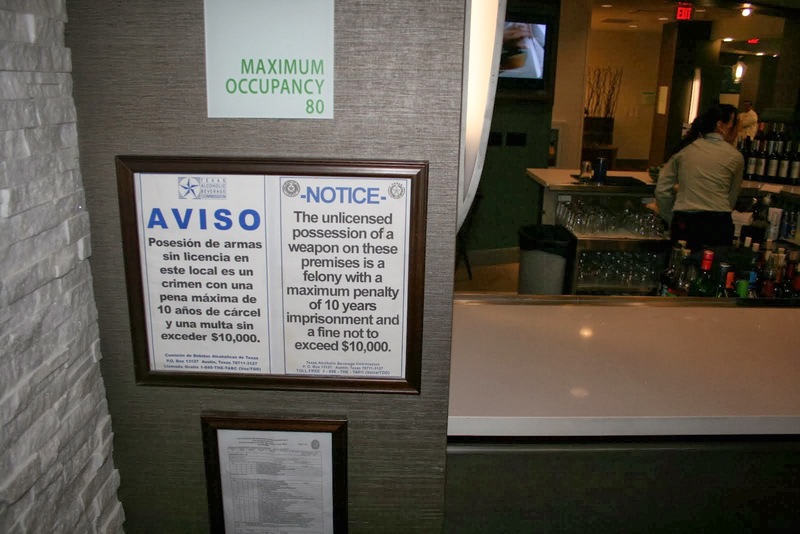 The accompanying photo illustrates the value of testing. 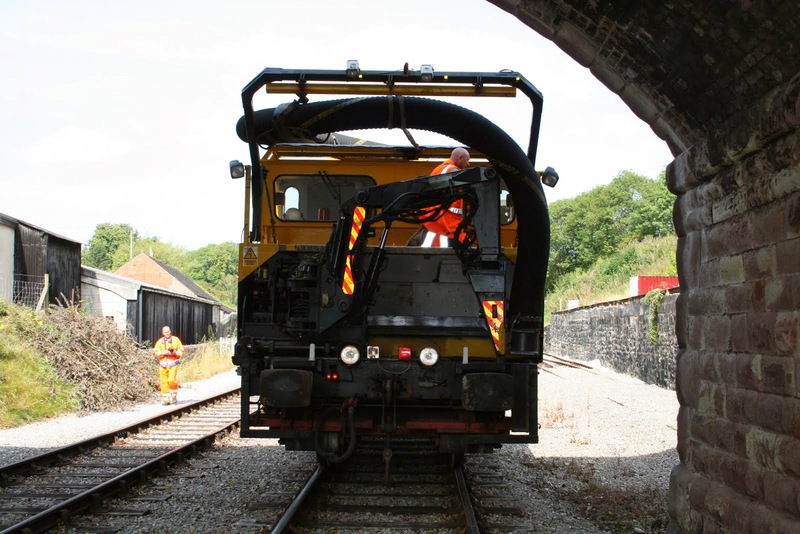 The first Railvac we received was of UIC gauge used throughout mainland Europe but was a little to large to fit through a former Midland Railway bridge necessitating the construction of a new vehicle that spent some time with us in early 2013 and is now to been seen throughout the national network. It reminds me that we still do a little testing with our regular "walking stick" customers paying a brief visit today. Another day of intense activity. A team arrived under the leadership of the LCC to decorate our Santa train and joined later in the day the Catering group to ensure the Pullman coaches had the right atmosphere for this upcoming weekend. Tremendous thanks to all who participated as we approach our most demanding Santa programme ever. The PWT participated in the Christmas spirit by transporting the North Pole tree southwards, it is something to do with the space time continuum differential, and transported a recovered cabinet from Gorsey Bank to Shottle, recovered handrails from the long disused cabinet near the Holloway Road foot crossing for reuse and effected repairs to the Duffield footbridge. Logs were garnered from the lineside for resale. At Wirksworth there was progress with one of the two ground frames required for the Shottle loop project. I was too generous with my praise for the VCT who had misinterpreted the Duffield footbridge requirement thus the Scottish product promised has been withdrawn and they will have to be content with a cup of tea. 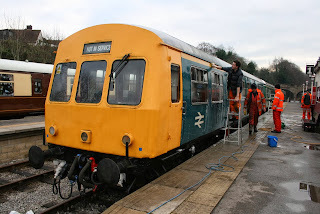 Back at base diesel railcar 50599 has had work to replace water damaged guards van interior panels and the head of department yesterday corrected my photo as I had ascribed a wrong class number. There may be night classes for this. The Pullman Buffet Car had a reasonably active day and the Booking Hall has been squeezing the last Santa clients onto the few remaining seats. PS - many congratulations to Rodney who has secured a post with the contractors erecting the masts for the overhead wires of the Nottingham light rail extensions. Tremendous effort being put into preparing for our first Santa trains this coming weekend. There has been much washing of the exterior of the Santa train as illustrated and the opportunity was also taken to clean the Class 119 and Iris also illustrated to show the head of the department participating in the cleansing process. 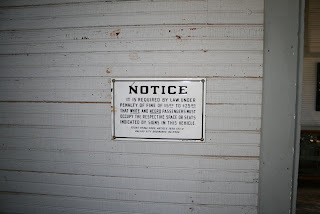 Fred and the other Iris, a human being, gave the Mess Hall their traditional deep clean and the PWT occupied their time undertaking the fortnightly track patrol. The SBT were engaged in completing the new drainage at Shottle and a general tidy up as we search for funds to move this project forward. 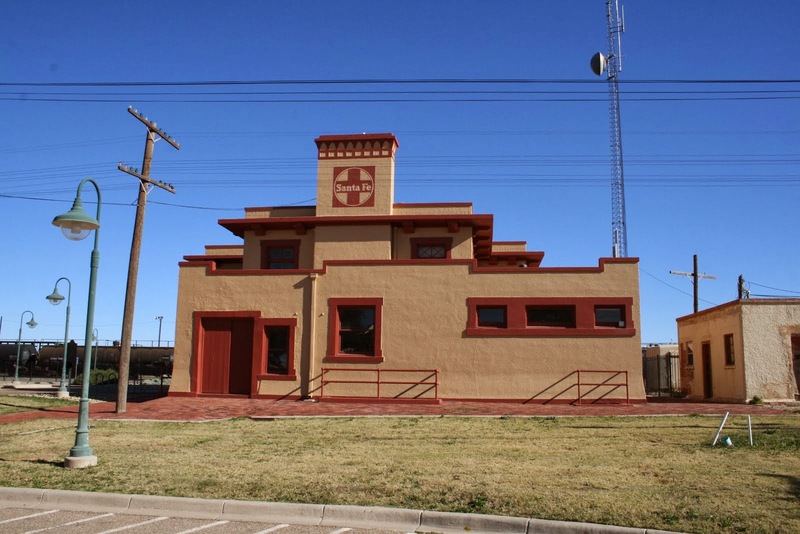 The LMSCA concentrated on their Third Open as the exterior finish comes together and the DST wrestled with Cathryn's springs. The M1M struggled with their Second Open reporting the replacement of a window. The VCT starred today having had some requests that were not strictly related to line clearance. 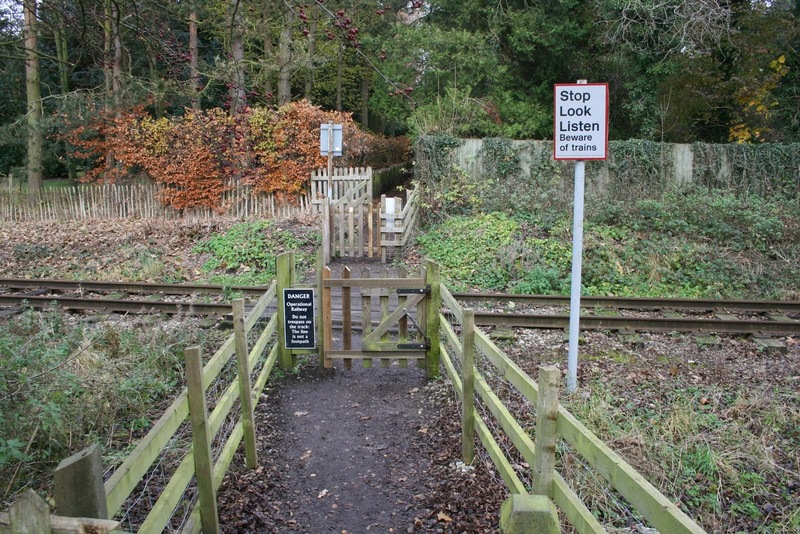 The Derbyshire County Council required a further amendment to the Holloway Road foot crossing which was dealt with and a resident of Duffield had reported a tripping hazard on the recently refurbished footbridge. This again was dealt with by the VCT in addition to substantial clearance on the west (down) side of the area around MP 134. Five members of the team participated with three large fires to burn the brash. Many thanks to all involved who all deserve a hot bath and some Scottish product to complete their day. We also had the advantage of some contractors appointed by Network Rail to clear vegetation to facilitate inspection of structure DJW6 - this seem to have taken around 2 hours! Santa also featured with the LCC dealing with present packing and assembly and the Pullman coaches had their first touch of Christmas. The Pullman Buffet Car had quite a productive day and the Booking Hall processed a spectacular number of Santa bookings received over the weekend. The Catering Manager bought a vineyard of wine and emptied Sainsbury's of mince pies. The teams that have decorated Wirksworth Station deserve great credit as we prepare to welcome our first Santa guests this weekend. This Thursday, the 5th December at approx. 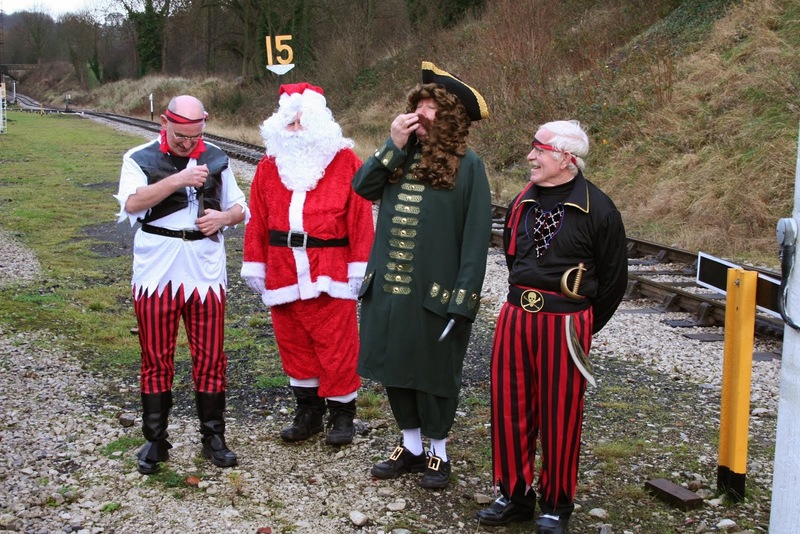 15:00 is the cut off point for booking for our Santa Specials if you would like to travel this weekend (7th or 8th). 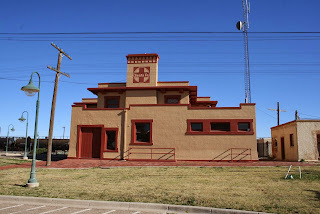 We still have limited seats available for this weekend available to pre-book online at www.e-v-r.com/santa . Sorry, we do not have any seats available on the day. A delightfully sunny winter day here in the Gem of the Peak, which brought a multitude of Santa's Little Helpers who beavered away in the Present Preparation Emporium, while the dwarves blew out the fuses on several sets of Christmas lights. The tree arrived at an astonishingly convenient time (compared to when it usually arrives) and this was put up in a very soon moment before being decked out in Yuletide Celebrants (No elves were inebriated during this process). Meanwhile, down the yard, the Tarp Tuggers (the shed seems to have acquired a tarpaulin for bad weather operations) proceeded with the grinding and welding of unit 56223 as well as fitting the carriage connection bellows and painting the guard's van interior. Nearby, the Austerity continued to receive attention to its wheels and now four out of six have been painted and the fifth was getting a jolly good scrape. 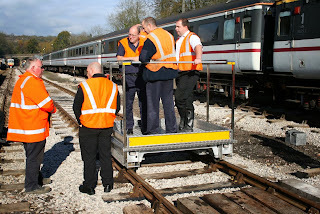 Various visitors attended these proceedings including friends from Germany and from Holland, who were given an in-depth experience in LJ Breeze courtesy of its personal assistants, who later shunted the LMS nut roasting van into platform 3. From their lofty heights, the Guerilla Gardeners surveyed our endeavours, handed out chocolate cake, consulted about their hedge, demonstrated a curious sewage problem and began working their way down part of the embankment, which will see an eventual improvement to the hoary old view from our platform.